If your law firm handles multiple foreign immigration cases, if you need USCIS-approved legal translations with a translation affidavit, or if you want to study or do business in a new country, you’ll need accurate translations from a legal translation company you can trust. Our professional legal translators will provide your documents with the proper terminology and precision that’s required for these procedures. 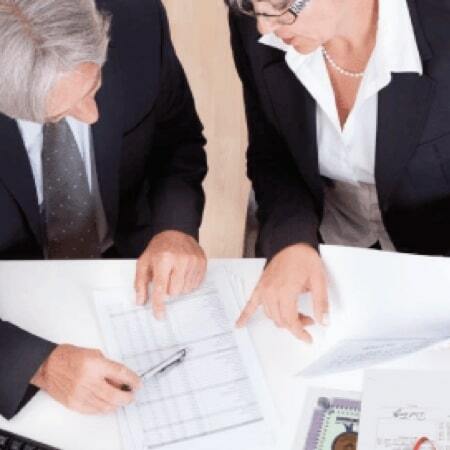 Your legal documents will be in the hands of experts. Day Translations is a proud member of the American Translators Association (ATA). We can provide certified translation and translation affidavits for all your legal documents, including birth certificates, driver’s licenses and passports. 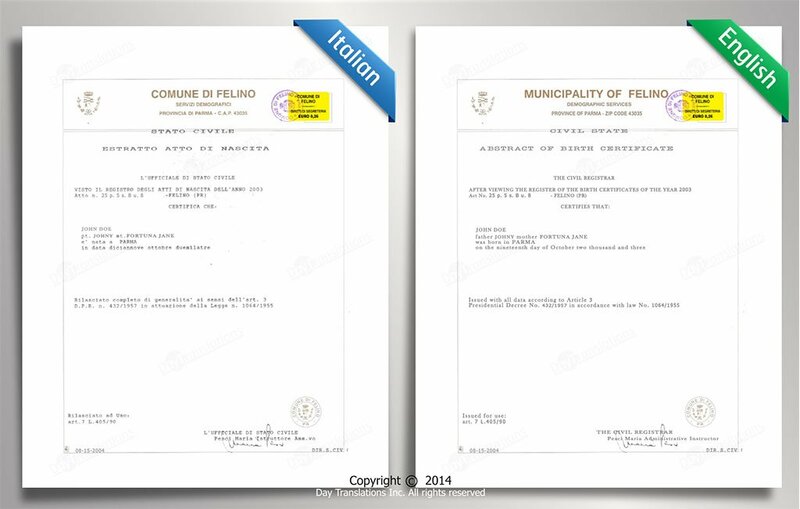 We’ll even provide the certification of your documents completely free of charge with all legal translation services. Because laws vary between countries, accurate adaptation of legal texts is crucial for the avoidance of lawsuits when negotiating contracts and exchanging legal documents. Translations in the field of law – legal translations – need to be precise and technical, accurately defining the rights and obligations of the parties involved. For proper legal document translations, the language provider should not only be fluent in both languages involved, but must also understand and handle legal terminology to avoid even the slightest misinterpretation. We, as a legal translation company can assure you that we will handle your documents with careful precision and efficiency. Legal translation errors in immigration, courtroom, or corporate settings could put your visa application at risk or cause unnecessary legal battles for your company. 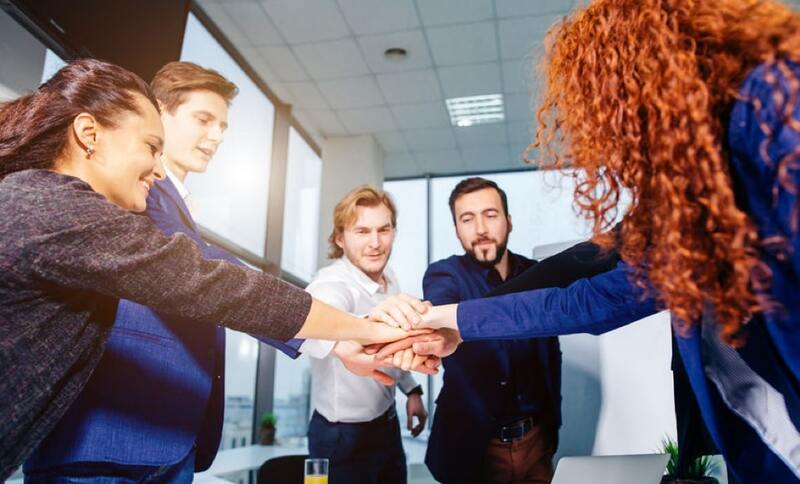 It’s vital to select a trustworthy, proven legal translation agency with first-class law training, USCIS approval, and extensive expertise in legal terminology. We’re a leading legal translation company that provides all types of legal translation services in over 100 languages, and we ensure that every word is as accurate and legally binding in its target language as it is in the original – 100% true to the source guaranteed. 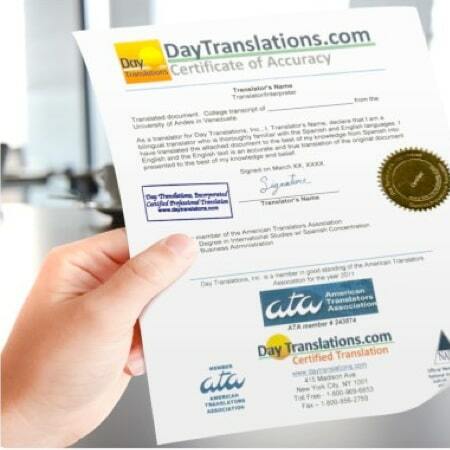 When your documents need to be professionally translated and accompanied by a signed Certificate of Accuracy, you want a professional translation company to handle it. Foreign high schools, universities, government and immigration authorities will ask for a certified translation of any documents that are not in that country’s native language. 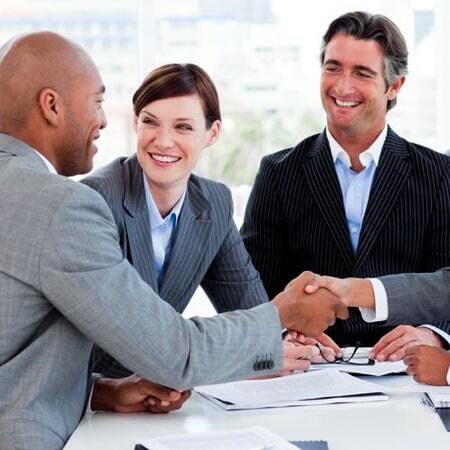 Ensure acceptance with our legal translation services. When you handle numerous clients in multiple languages, not only does the workload add up, but so does the cost of certification. Besides offering legal document translations, we provide USCIS-accepted certified translations across the United States, with certification absolutely FREE. Day Translations can also provide a translation affidavit upon request, and if you are unsure of what type of document you need, our expert team is available 24/7 to advise you. 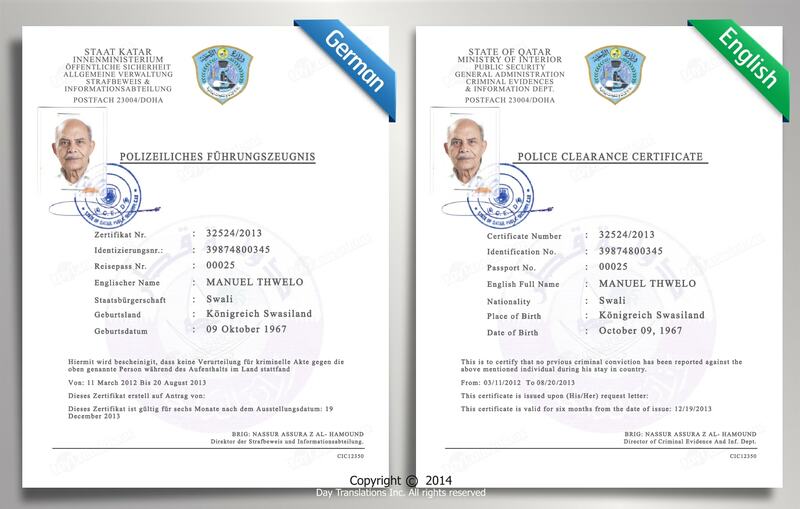 We can provide you with certified translation services and translation affidavits for all your documents. These sworn statements contain the name of our authorized representative, our certification stamp and official seal, our company’s qualifications and accreditations, and the details of the translation itself. The translation affidavit also contains the official notary seal and signature of the notary public or commissioner of oaths. Globally accepted and USCIS-approved. Guaranteed.